The bitter cold of this (so far) snow-free January let up yesterday. I could NOT resist taking a nice long “Thinking Walk” (to borrow a phrase from Winnie the Pooh). I was rewarded with this beauty of a fishing shed and her wobbily door. As you can imagine, I wasn’t alone. Lots of dog walkers. I bet most doggies protested two days ago when the wind chill was -20C. But yesterday was a glorious 10c above. And out we all trotted! The crows were plentiful, too. They were calling to each other, foraging in the grasses and even, like this one, stopping to rest and appreciate. At least that’s what I like to think he was doing. Or maybe he had me under surveillance. A little bit snowy, a little bit foggy, a little bit sunny. Late afternoon light on a December afternoon. A moment of quiet amidst the frenzy of preparations. This late summer squash blossom is attracting lots of attention from the honey bees. They seem to be queuing up. And, if you could see further in, you’d find three more bees in the throats of the flower. Amazing!! If you challenge me to state my “happy place” I won’t do it. It’s not because I’m being difficult, or because I am unhappy. But rather because I have found happiness in so many “places” I couldn’t possibly pin down just one. 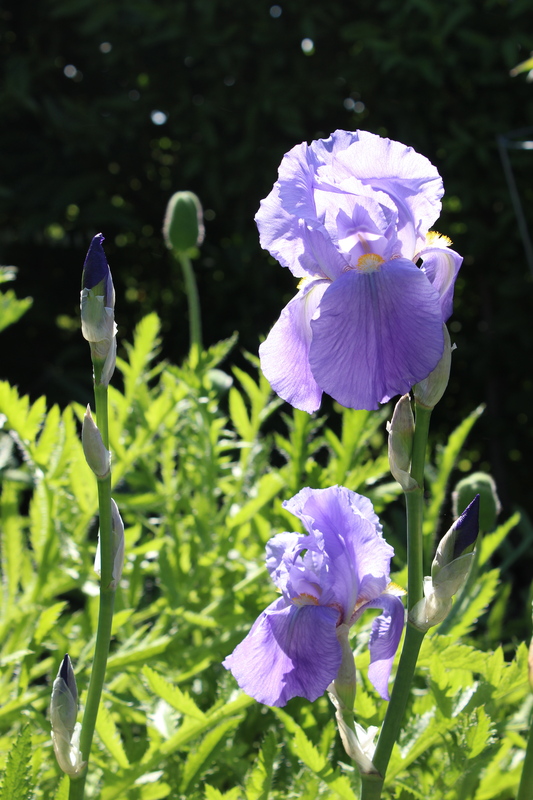 I am happy in all the usual places like in my home especially (like this weekend) when my kids are around or in my garden, or touring on my bicycle. I have found great happiness in the most unlikely places such as stuck in traffic with a good friend, or in a hospital (specifically in a delivery room when my sons were born). So, I think happiness has little to do with place. This weekend our boys (plus one girlfriend) and a group of our friends gathered here at our place to help us harvest our grapes. That generosity made me happy. Seeing those grapes off to the winery, taking all the fretting and worrying with them, made me very happy indeed. Today, with all that work behind us, and weather feeling more like summer than mid autumn, Son #1 and I drove to his favourite beach, just to look at the water. It’s only 10 minutes from home. This boy has just graduated from university and is in the process of sorting out the next steps in his journey – trying so hard to get it just right. We are lucky to live in a place that is literally surrounded by beaches. But this one. 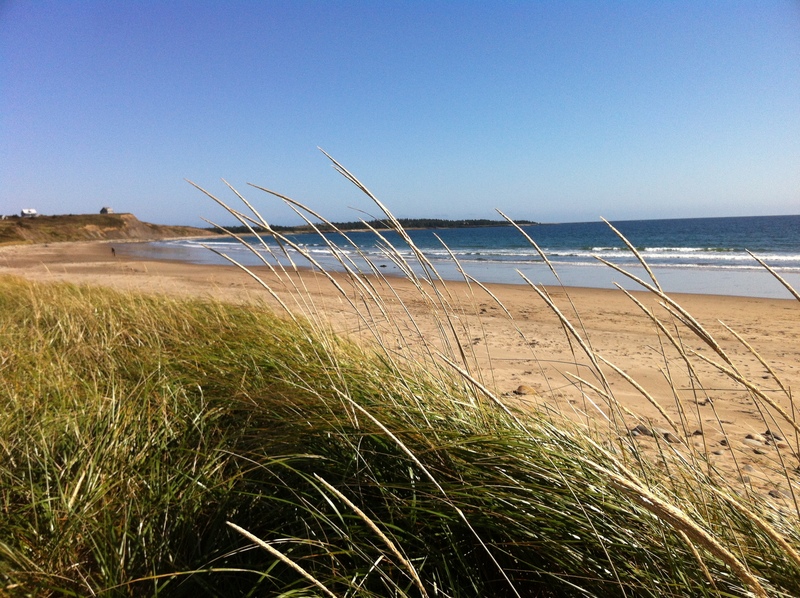 This beautiful place with more than three kilometres of sand facing the North Atlantic is a pretty special spot. For a moment this afternoon, standing there together, with our feet in the sand and the sun on our faces, drinking in the gentle surf and the breeze …… well, that was a lovely moment of happiness. Finally – green and growing. 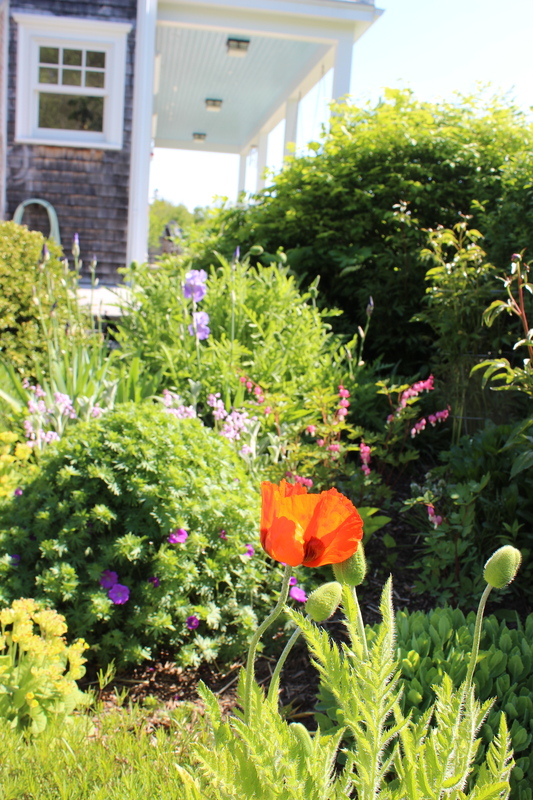 Even though we are a full two weeks behind the usual growing season this year, the June garden is full of promise. 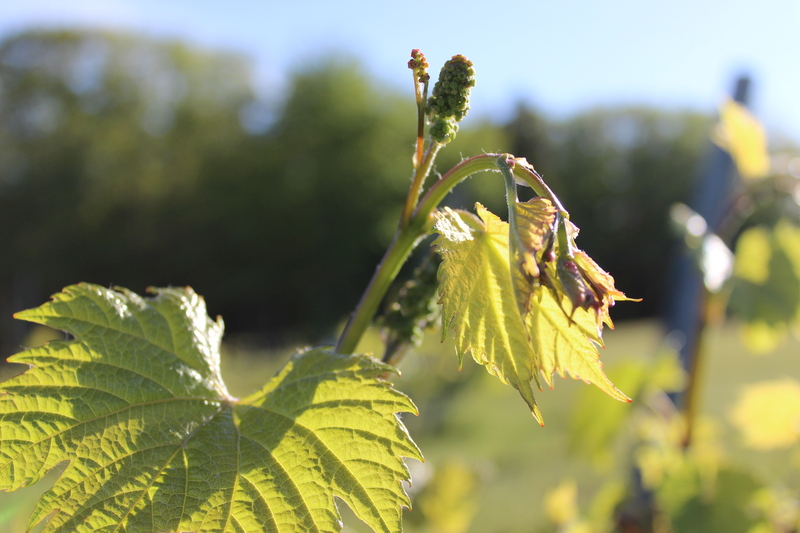 In the vineyard, the grapes are just beginning to flower. We are working hard to double the plantings in our little vineyard this spring, so these little flowers are very encouraging. 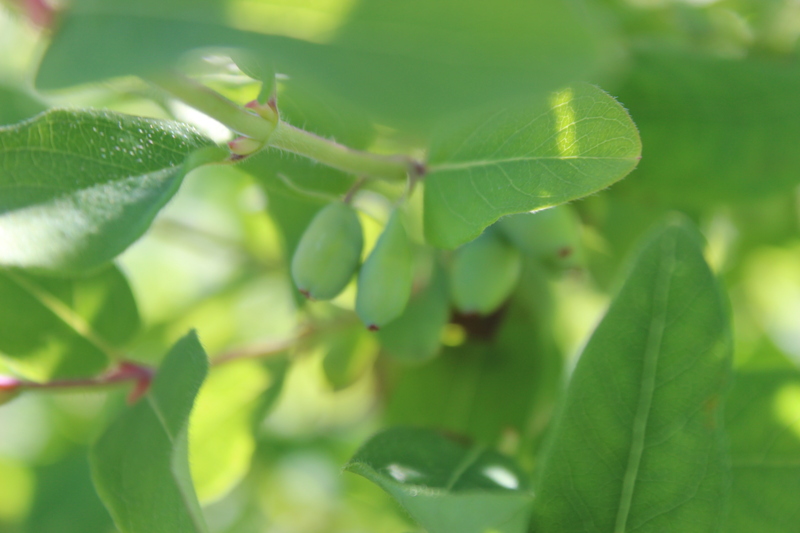 The Hascap berries are fully formed and just thinking about turning blue. They should be ripe in about 2 or 3 weeks. Do you know about hascaps? 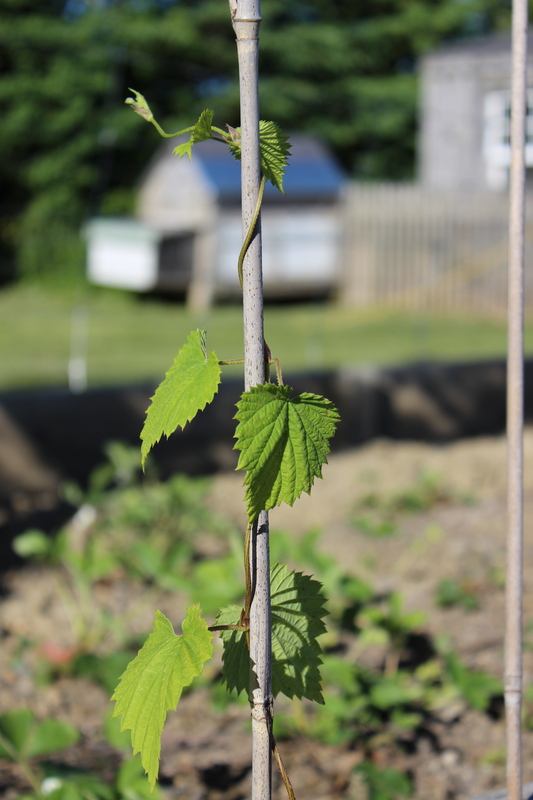 The hops are reaching….. reaching….. reaching! 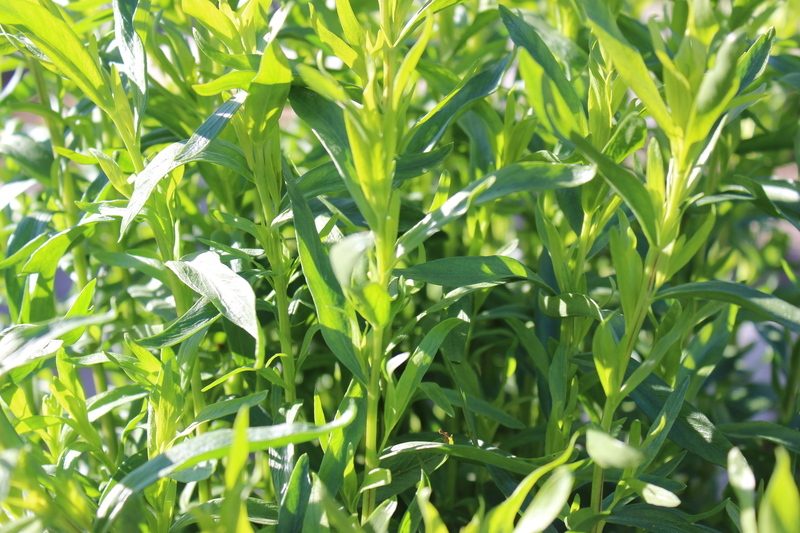 The French Tarragon is at it’s peak! Yum! 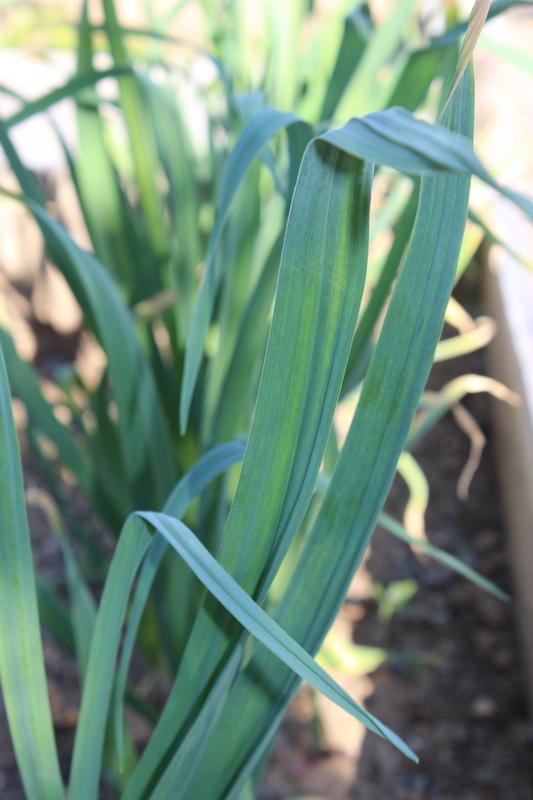 The hard neck garlic is looking hale and healthy. 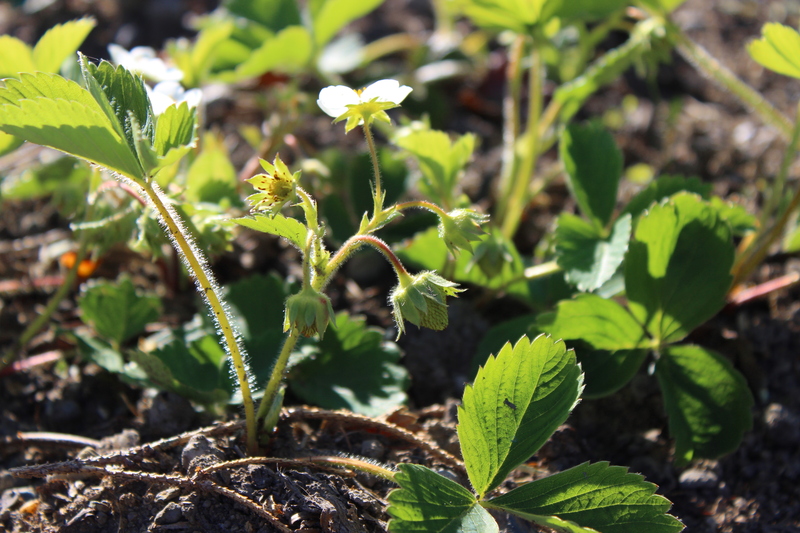 And the strawberries are coming along. Do you remember the cold frame that was buried under several feet of snow this winter? 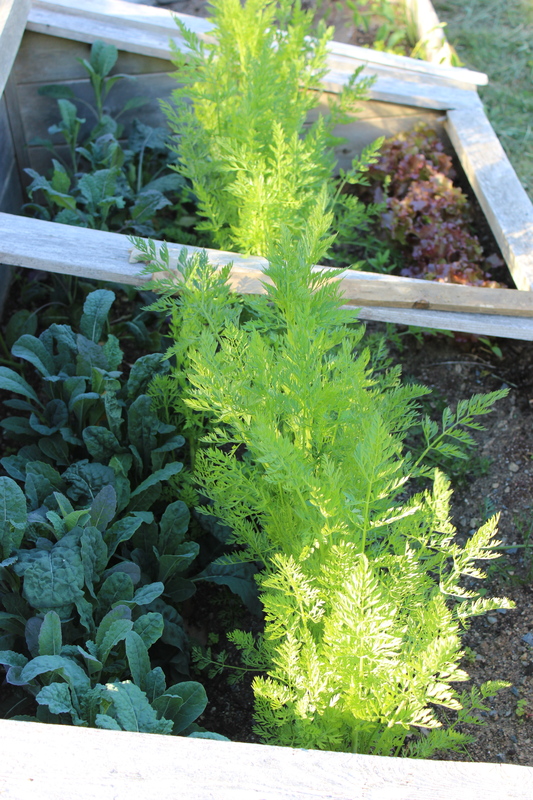 Well, here’s what has been going on in there… the carrots, kale and lettuce thrived… and are now giving us an early harvest. We’ve happily been enjoying the kale for weeks. 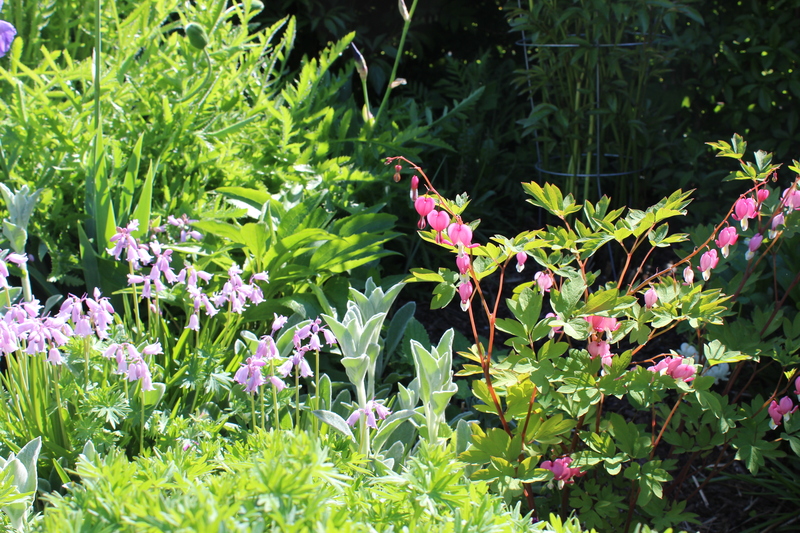 bleeding heart, bluebells, lambs ears, and …. 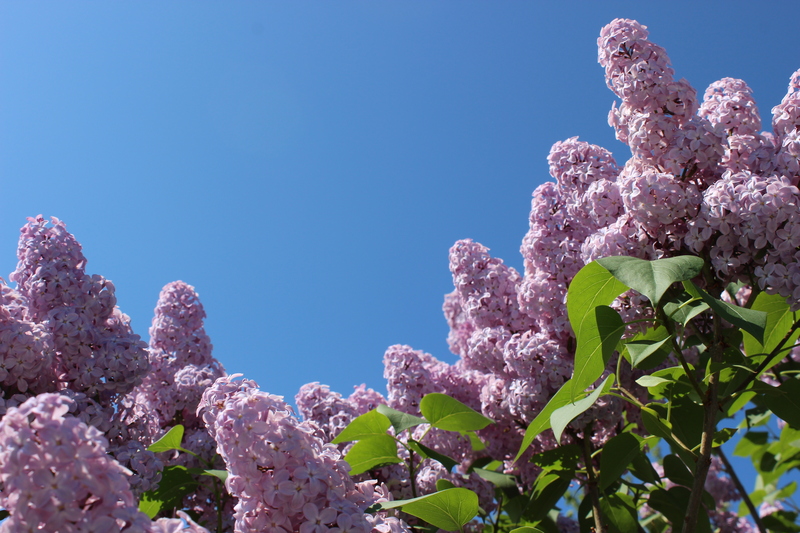 If you ask me, nothing says “June Garden” like the sight and scent of the lilac. 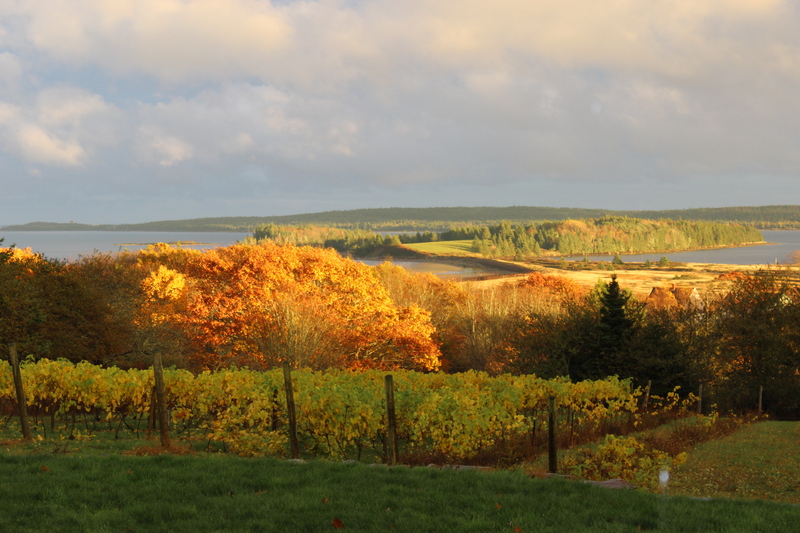 Overlooking the vineyard and the beach on a November afternoon.